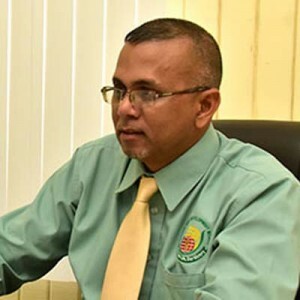 The General Manager of the Guyana Rice Development Board (GRDB), Nizam Hassan could be sent off the job later this week, days after he was arraigned on an indictable fraud charge. Hassan is on GYD$250,000 bail in connection with alleged fraud in relation to the construction of the New Guyana Marketing Corporation (NGMC) building on Robb and Alexander Streets, Georgetown. Demerara Waves Online News was told that the GRDB Board is scheduled to meet on Wednesday and Hassan’s fate would most likely be discussed. He is an ex-officio board member. One source suggested that GRDB Extension Manager, Kuldip Ragnauth might take over responsibility for semi-autonomous agency. Hassan was at work on Tuesday, one day after he and Ministry of Agriculture Engineer, Hanniel Madramootoo, his wife Felicia De Souza-Madaramootoo and Directors of the Trinidad-based Constantine Engineering and Construction Services Limited- Phillip Madramootoo were arraigned. They have to return to court on December 7, 2016. Arrest warrants have been issued for the Directors of Phillip Madramootoo and Nizam Ramkissoon who are directors of Constantine Engineering ad Construction Services Limited. They are jointly charged with conspiracy to commit a misdemeanor of procuring money to be paid by false pretense with intent to defraud between October 28, 2010 and April 25, 2012.